Description: The Senior Corps Program at Connections is collection items for US troops serving overseas. The Iowa Cookie Crumbs will ship donated items to military personnel. Items may be take to any of the Connections offices, in Council Bluffs, Creston or Sioux City. See link for a listing on snack and comfort items. Description: Summit House Residents will join us for refreshments and information about how to lower Medicare costs. Tasha will be explaining Social Security and Medicare programs that can give savings on prescription and Medicare costs. No sales will be made. Description: Day long event for persons with parkinson's disease and their caregivers. Visit with Connections Staff at their table during the conference's breaks! Description: Greenfield Villages Residents will join us for refreshments and information about how to lower Medicare costs. Tasha will be explaining Social Security and Medicare programs that can give savings on prescription and Medicare costs. No sales will be made. 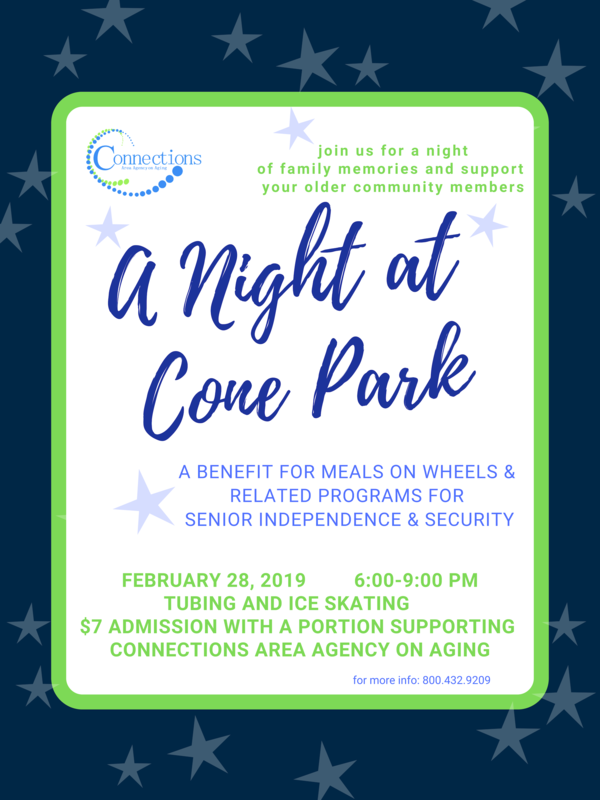 Description: Join us for a night of family memories and fun, benefiting Meals on Wheels and other related programs from Senior independence and security. on-line at webtrac.sioux-city.org, by calling 712. 279.6129 or stopping in at the Parks and Rec Adminstration Office at Long Line Rec Center on 401 Gordon Drive. A portion of your admission will benefit Meals on Wheels and related programs. Ice Skate rentals are an additional $3/pair.